This article is about the Alaskan volcano. For other uses, see Mount Redoubt (disambiguation). Redoubt Volcano, or Mount Redoubt, is an active stratovolcano in the largely volcanic Aleutian Range of the U.S. state of Alaska. Located at the head of the Chigmit Mountains subrange in Lake Clark National Park and Preserve, the mountain is just west of Cook Inlet, in the Kenai Peninsula Borough about 110 miles (180 km) southwest of Anchorage. At 10,197 feet (3,108 m), in just over 5 miles (8 km) Mount Redoubt attains 9,150 feet (2,700 m) of prominence over its surrounding terrain. It is the highest summit in the Aleutian Range. In 1976, Redoubt Volcano was designated as a National Natural Landmark by the National Park Service. Active for millennia, Mount Redoubt has erupted four times since it was first observed: in 1902, 1966, 1989 and 2009, with two questionable eruptions in 1881 and 1933. The eruption in 1989 spewed volcanic ash to a height of 45,000 ft (14,000 m). It caught KLM Flight 867, a Boeing 747 aircraft, in its plume. After the plane descended 13,000 feet, the pilots restarted the engines and landed the plane safely at Anchorage. The ash blanketed an area of about 7,700 sq mi (20,000 km2). The 1989 eruption is also notable for being the first ever volcanic eruption to be successfully predicted by the method of long-period seismic events developed by Swiss/American volcanologist Bernard Chouet. As of August 2015, the Alaska Volcano Observatory has rated Redoubt as Aviation Alert Level Green and Volcano Alert Level Normal. The official name of the mountain is Redoubt Volcano, a translation of the Russian name "Sopka Redutskaya", referring to, as does the word "redoubt", "a fortified place". A local name, "Ujakushatsch", also means "fortified place", but it is difficult to determine if one name is derived from the other. The Board on Geographic Names decided on the name "Redoubt Volcano" in 1891. The Global Volcanism Program of the Smithsonian Institution refers to the mountain simply as "Redoubt", and lists the following as alternate names: Burnt Mountain, Goreloi, Mirando, Ujakushatsch, Viesokaia and Yjakushatsch. The Alaska Volcano Observatory also uses simply "Redoubt"; it lists the same alternate names in addition to the following: Goryalaya; Redoute Mtn. ; and Redutskaya, Sopka. A chunk of andesite thrown from the volcano in 2009 is seen on display at the Anchorage Museum in March 2011. The volcano is about 3.7 miles (6.0 km) in diameter at its base with a rough volume of 7.2 to 8.4 cu mi (30–35 km3). The sides of the upper cone are relatively steep (in comparison to volcanoes in general). Made up of pyroclastic flow deposits and lava flows, and resting on Mesozoic era rocks of the Aleutian Mountain Range batholith, the mountain has been somewhat weathered by movement of several glaciers that reside on it. The current main vent is on the north side of the crater by the head of the Drift glacier. Also present on the mountain are Holocene lahar deposits that extend as far as the Cook Inlet. This mountain has produced andesite, basalt and dacite, with relatively silicic andesite dominant in recent eruptions. Captain James Cook saw Mt. Redoubt during the summer of 1778, describing it as "emitting a white smoke but no fire which made some think it was no more than a white thick cloud such as we have frequently seen on the Coast, for the most part appearing on the sides of hills and often extends along a whole range and at different times falls or rises, expands or contracts itself and has a resemblance to Clouds of white smoke. But this besides being too small for one of those clouds, remained as it were fixed in the same spot for the whole time the Mountain was clear which was above 48 hours." However, several sources call this a "discredited eruption". There are several other of these activities that are not called eruptions. In 1819, smoke was observed at the mountain. However, this is often not recorded as an eruption as the information was insufficient to identify it as such. Similarly, in 2003, a blowing cloud of snow was mistaken by an employee of the ConocoPhillips Building in Anchorage for an ash plume. Possible steam-vapor let off was observed in 1933 at the mountain. A plume of vapor from Mt Redoubt as seen from space on 5 May 2009. There was apparently an eruption described as "to the eastward, Redoubt Volcano, 11,060 feet (3,370 m) high, is constantly smoking, with periods of exaggerated activity. Fire has been seen issuing from its summit far out at sea. A great eruption took place in 1881, when a party of native hunters half-way up its slopes were overwhelmed by a lava-flow and only two escaped." However, this eruption is not well documented by other sources. The volcano erupted rather abruptly in 1902, spewing out ash from January 18 to June 21 in the year. A local newspaper stated, "Word has just been received that Redoubt, one of the volcanoes at Cook's Inlet had an eruption on January 18, and the country for 150 miles (240 km) around was covered with ashes and lava. The news comes from Sunrise, but nothing definite has been ascertained as to whether any damage was done, for no boats have as yet been in the neighborhood of the volcano." There were many other news reports on the eruption, one describing the eruption as "a terrific earthquake which burst the mountain asunder leaving a large gap," which could possibly suggest the crack formation in the volcano's crater, however, it is unlikely. Supposedly, the volcano was ejecting "flames" from its crater, and the eruption terrified natives in the area. Newspapers seemed to suggest that the ash had traveled for more than 150 miles (240 km), reaching the opposite side of the Cook Inlet. The volcano erupted on December 14, 1989, and continued to erupt for over six months. Sudden melting of snow and ice at the summit caused by pyroclastic flows and dome collapses caused lahars, or mudflows, which flowed down the north flank of the mountain. A majority of the mudflows coursed to Cook Inlet, about 22 miles (35 km) from the volcano. The lahars entered a nearby river, worrying officials that they might destroy an oil storage facility located along it. Since lahars were produced repeatedly, scientists realized that they could use these to analyze a trial period for a newly developed device proposed to measure the movement of rocks against each other. This device, now known as an Acoustic Flow Monitor, alerts nearby stations to possible lahars. The eruption also caused an airliner to have all four engines fail after a Boeing 747-400 jumbo jet operated by KLM Royal Dutch Airlines flew into a cloud of volcanic ash. Damage from the eruption was estimated at $160 million, the second costliest volcanic eruption in United States history. On January 24, 2009, a magnitude 5.8 earthquake hit the region at a depth of 98 kilometers. The relation to the eruption is unknown, but was the strongest in the vicinity since 2001. On January 30, 2009, scientists from the Alaska Volcano Observatory (AVO) warned that an eruption was imminent, sending experienced Alaskans shopping for protection against a dusty shower of volcanic ash that could descend on south-central Alaska. By January 31, volcanic earthquakes increased to several per hour, and a large hole in the glacier on the side of the mountain was spotted. Scientists began to monitor seismic data from the mountain twenty-four hours a day in an effort to warn people in nearby communities. A fly over conducted by the AVO detected "significant steaming from a new melt depression at the mouth of the summit crater near the vent area of the 1989-90 eruption." Seismic activity at Redoubt increased beginning about 13:01 ATZ. An AVO observation flight reported that a steam and ash plume rose as high as 15,000 feet (4,600 m) above sea level and produced minor ash fall on the upper south flank of Redoubt. Later reports were that the plume was then mainly steam. On the basis of this change in activity, AVO increased the level of concern and alert level to ORANGE/WATCH. The material ejected from the volcano mainly consisted of water vapor, along with smaller amounts of carbon dioxide and sulfur dioxide. Further study by airborne monitors suggests that the materials were not oxidized much, and little of the concentration contained sulfates, less than 20%. Mount Redoubt erupted explosively late in the evening of March 22, 2009. AVO has recorded numerous volcanic eruptions and/or explosions at Redoubt volcano. ^ a b c "Redoubt Volcano". Bivouac.com. Retrieved 2009-01-07. ^ a b "Redoubt". Global Volcanism Program. Smithsonian Institution. Retrieved 2009-01-07. ^ Alaska Volcano Observatory . Retrieved on 2009-10-2. ^ "Aleutian Ranges". peakbagger. Retrieved 2012-11-21. ^ "National Natural Landmarks - National Natural Landmarks (U.S. National Park Service)". www.nps.gov. Retrieved 2019-03-20. ^ "Redoubt - Historic eruptions". ^ Chouet, Bernard (1996-03-28). "Long-period volcano seismicity: its sources and use in eruption forecasting". Nature. 380 (6572): 309–316. Bibcode:1996Natur.380..309C. doi:10.1038/380309a0. ^ "Alaska Volcano Observatory - Redoubt - Activity Page". Retrieved 2009-12-29. ^ a b "Feature Detail Report for: Redoubt Volcano". USGS. January 1, 2000. Retrieved 2009-03-27. ^ Alaska Volcano Observatory contributors. "Redoubt—Introduction". USGS. Retrieved 2009-03-27. ^ Miller; et al. (1998). Catalog of the Historically Active Volcanoes of Alaska. USGS. ^ Alaska Volcano Observatory contributors. "Event Specific Information: Redoubt — 1778". Alaska Volcano Observatory. Retrieved 2008-12-01. ^ Alaska Volcano Observatory contributors. "Event Specific Information: Redoubt — 1819". USGS. Retrieved 2008-12-01. ^ Alaska Volcano Observatory contributors. "Event Specific Information: Redoubt — 2003". Alaska Volcano Observatory. Retrieved 2008-12-01. ^ AVO contributors. "Event Specific Information: Redoubt — 1933". Alaska Volcano Observatory. Retrieved 2008-12-05. ^ "Bulletin of the Global Volcanism Network; volume 15 number 4 (April 1990)". Global Volcanism Program. Smithsonian Institution. 1990. Retrieved 14 January 2018. ^ AVO contributors. "Event Specific Information: Redoubt — 1881". Alaska Volcano Observatory. Retrieved 2008-12-01. ^ AVO contributors. "Event Specific Information: Redoubt — 1902". Alaska Volcano Observatory. Retrieved 2008-12-01. ^ a b (Subscription) Jennifer Nagorka (December 24, 1990). "Redoubt rumblings: Seismic data gathered at Alaska volcano help scientists hone prediction techniques". Dallas Morning News. Retrieved 2009-01-07. ^ a b USGS contributors (2008-10-11). "1989–90 Eruption of Redoubt Volcano, Alaska, and the First Test Case of a USGS Lahar-Detection System". USGS. Retrieved 2008-11-30. ^ "Redoubt Ash Cloud Forces Dutch 747 to Land". Deseret News. 1989-12-16. Retrieved 2008-11-30. ^ "Alaska Natural Productions:Mount Redoubt Information Page". Alaska Natural Productions. Retrieved 2008-11-30. ^ "Volcano Could Blow Any Minute". SKY News. January 30, 2009. Retrieved January 30, 2009. ^ Joling, Dan. "Scientist see boles in glacier at Alaska volcano". Associated Press. Retrieved 1 February 2009. 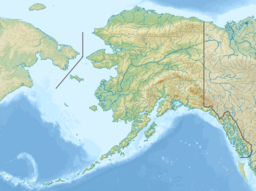 ^ "Alaska volcano has geologists on alert". ctv.ca. 29 January 2009. Retrieved 1 February 2009. ^ "Alaska Volcano Observatory Current Status Report Saturday, January 31, 2009 11:54 AM AKST". Alaska Volcano Observatory. January 31, 2009. Retrieved 2009-02-01. ^ Peter V. Hobbs; Lawrence F. Radke; Jamie H. Lyons; Roland J. Ferek; Derek J. Coffman; Thomas J. Casadevall (October 1991). "Airborne measurements of particle and gas emissions from the 1990 volcanic eruptions of Mount Redoubt". Journal of Geophysical Research. 96: 18735–18752. Bibcode:1991JGR....9618735H. doi:10.1029/91JD01635. ^ "Redoubt Activity". Alaska Volcano Observatory. Retrieved 2009-03-22. Wikimedia Commons has media related to Mount Redoubt (Alaska). Redoubt Volcano Webcam, USGS (intermittently available). View of north flank of Redoubt from AVO's Redoubt Hut, approximately 7.5 mi (12 km) from Redoubt's summit crater. Redoubt-CI webcam, Chevron via Alaska Volcano Observatory. View of northeast face from Oil Platform Anna in Gompertz Channel of Cook Inlet at 60°58′36″N 151°18′54″W﻿ / ﻿60.97667°N 151.31500°W﻿ / 60.97667; -151.31500﻿ (Oil Platform Anna), approximately 100 km (60 mi) NE of mountain. Large-format photo essay of the Mount Redoubt eruption from "The Big Picture" blog on Boston.com.